Natures Aid JointEeze Devils Claw Root Extract is a traditional herbal medicinal product used for the relief of backache, rheumatic or muscular pain and general aches and pains in the muscles and joints, based on traditional use only. Free From: Artificial Colours, Flavours & Preservatives. Adults and the elderly swallow one film coated tablet three times daily after food. 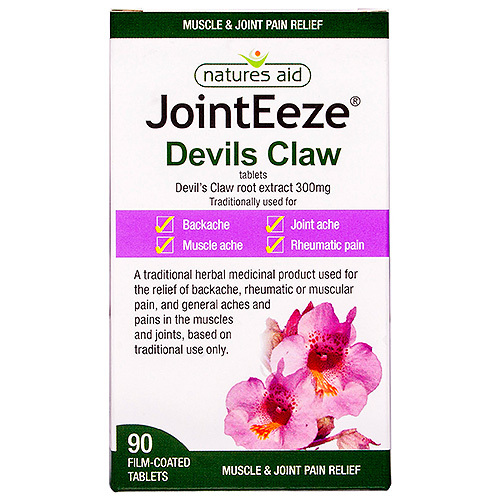 Below are reviews of Natures Aid JointEeze - Devils Claw - 90 Tablets by bodykind customers. If you have tried this product we'd love to hear what you think so please leave a review.